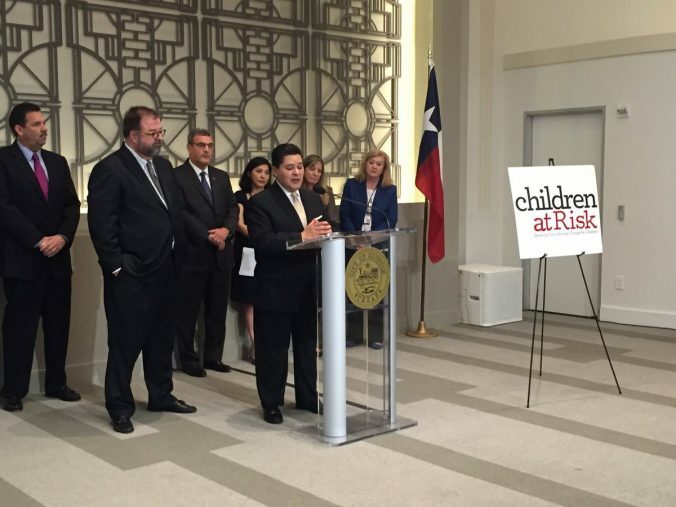 Houston Independent School District Superintendent Richard Carranza, together with superintendents from surrounding districts, joined Children At Risk on Tuesday for a press conference to bring awareness to the positive impact of early childhood education on student learning. Children At Risk is part of a multitude of community groups that are calling on state lawmakers to put more funding into Pre-K programming. They are taking action because the state’s Pre-K grant program, which started in 2015, is not fully funded in this year’s budget legislation. Research shows that students who enroll in Pre-K classes perform better in K-12, and students who participate in early childhood education are more likely to graduate high school and earn higher wages. HISD has offered full-day Pre-K instruction since 2006. Today, the district serves about 14,000 students at 155 campuses, as well as 10 early childhood centers. If you would like more information on HISD’s early childhood and Pre-K offerings, please visit the HISD Early Childhood Education website. This entry was posted in Early Education, News and tagged Children At risk, pre-kindergarten on March 28, 2017 by HISD Communications.